Stillwater Avenue is an street in Dukes, whichs runs along side Meadows Park. It starts as an overpass off Carson St, not far from the Beechwood City branch of Burger Shot, then runs through Cerveza Heights, running against the Lynch St. Station, and then goes into Meadow Hills, as explained eariler, runs along side Meadows Park and then stops. It, either, becomes a public footpath, along side the Liberty State Pavillion Towers, or becomes Tudor Street, which is the ringroad around Francis International Airport. 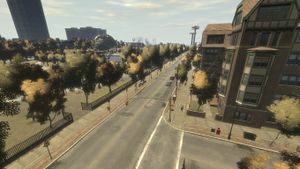 The name of the street could be a reference to Saints Row, a GTA clone, as the city where the games take place is called Stilwater. Or it could be a reference to one of the battles within the Battles of Saratoga, some of the battles in the American Revolutionary War. It may also be a reference to a New York village, named Stillwater.